I have an idea for tackling this “fake news” problem. Have you seen the movie The Purge? Or any of its two sequels, The Purge: Anarchy and The Purge: Election Year? I haven’t, but I’ve seen the Rick And Morty episode called Look Who’s Purging Now. And the original Star Trek TV episode called The Return Of The Archons. There’s also a new Purge movie, a prequel called The First Purge, coming in a few months, for you to binge and purge. Anyway, the idea is that to maintain order, people are allowed one night a year to go nuts and break all the laws they want to vent the violence and hatred that they keep bottled up. What I suggest for real life is that we set aside one day a year where we allow people to spread all falsehoods they want to get it out of their system and on that date, you will know not to believe everything that everyone says. To make the date easy to remember, it could be the first day of the month, like, say, April 1. We can call it… Easter Sunday. It would be called Easter Sunday only if April 1 doesn’t fall on a Sunday since the whole purpose of the day is to misinform. You mean there’s already an April Fool’s Day on April 1 where people make it a point to tell lies as a joke? Is that why Burger King introduced the Chocolate Whopper, made of chocolate cake bun, flame-grilled chocolate patty, raspberry syrup, white chocolate rings as onions, candied blood oranges as tomatoes, chocolate leaves as lettuce and vanilla frosting as mayo? My keyboard is now sticky with drool after I typed that last paragraph. But when I learnt there was actually no such burger and that it was just a April Fool’s joke by Burger King, my feelings were cheated, my heart was broken and my stomach was unfilled. This is how fake news does real harm. Never mind flame-grilled. Burger King should be grilled for six hours by Mr K Shanmugam at the Select Committee hearing. And Ronald McDonald should be sitting in the public gallery holding up a stack of paper which displayed the cover of the book Complete Guide to GCE O Level Social Studies Volume 1 until he is forcibly carried out by police grabbing under his red-striped armpits. After re-examining Burger King’s Fakebook - I mean, Facebook page, I also realised that the fast food chain introduced the Chocolate Whopper on Good Friday, not April Fool’s Day. 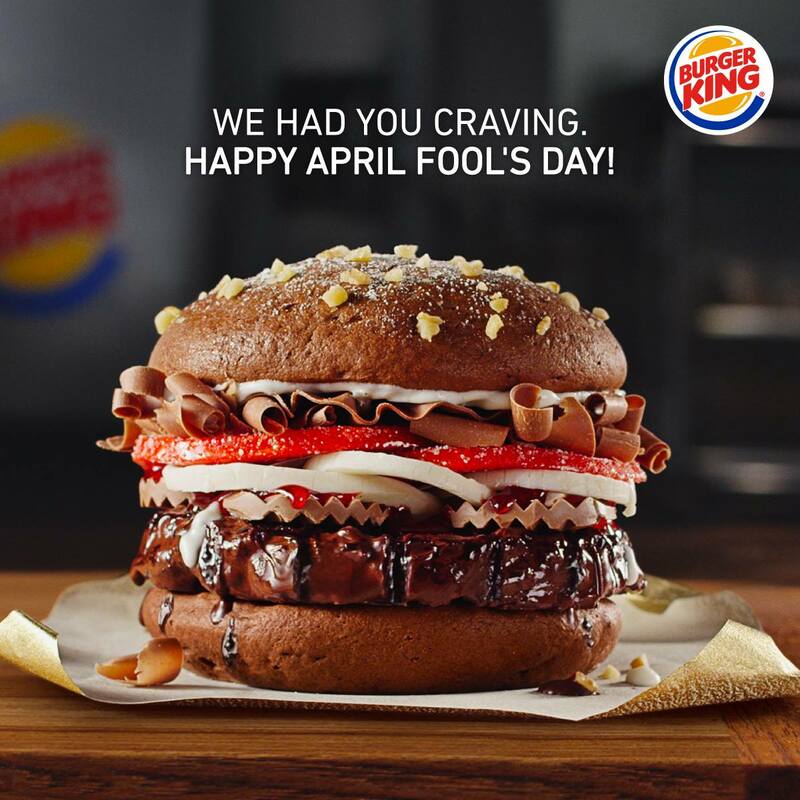 On the actual April Fool’s Day, which was yesterday, Burger King fessed up and revealed that the Chocolate Whopper was a hoax. What sacrilege is this? On Easter Sunday too. It’s a perversion of what April Fool’s Day is about. What’s the point of having April Fool’s Day if you’re going to spread fake news on days that are not April Fool’s Day? How would you like it if you were murdered on a night when it’s not The Purge? You’d be pretty damn pissed, right? Perhaps we need more rules. Let’s have another Select Committee hearing for that.